Dr. Elizabeth Lev speaks with students in the EC AP Art History class. 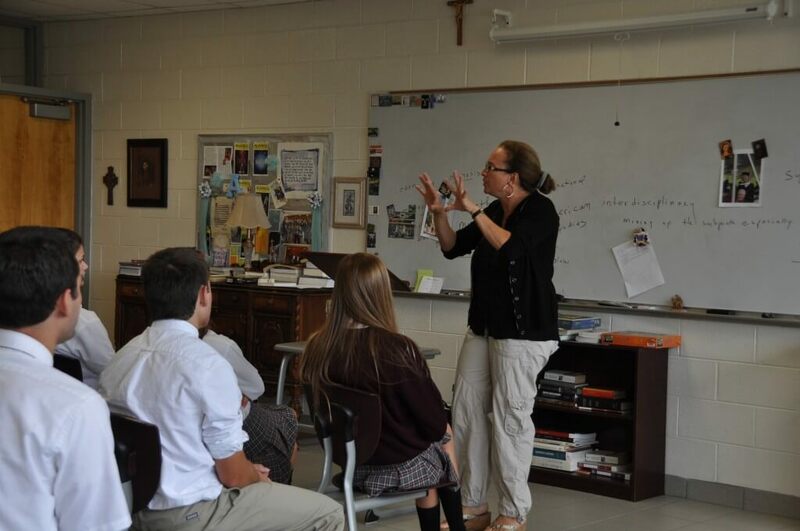 The AP Art History students at Everest Collegiate were privileged to have a visit from art historian for the Vatican Museums and docent for the Sistine Chapel, Dr. Elizabeth (Liz) Lev, who talked with the students about her expiences in her field. An American-born art historian, Dr. Lev lives, with her husband and three children, just minutes from St. Peter’s Basilica and the Vatican Museums. She is a published author. Her articles have appeared in Inside the Vatican, Sacerdos, First Things magazine, the College Art Association (on-line), Zenit News and AOL’s Politics Daily. She published her first biography, The Tigress of Forli: The Remarkable Story of Caterina Riario Sforza, in 2011, and has also co-authored books with George Weigel and Father José Granados. Dr. Lev has been featured on television and radio in programs such as ABC’s Nightline, the Today Show, in the series ‘MUSEUM SECRETS’ for History television and Brad Meltzer’s “Decoded”. Dr. Lev also hosted “Catholic Canvas”, a 10-part television series on the art of the Vatican Museums, which aired on EWTN. For more information on Liz Lev, visit her website.